A couple weeks ago we talked about the Apostille certification that is needed on some documents if you plan to travel with them internationally. Many of those materials are considered legal documents and thus will need to be translated by a professional service and certified accurate. Not unlike a marriage license or a death certificate, legal paperwork, proceedings and patents also need the services of translation professionals to make sure all the proper steps are being followed and proceedings are understood by all parties involved, no matter what language the involved parties speak. At Link-Translations we take confidence in our ability to turn around a project quickly and accurately and with a professional level of confidentiality that our clients have come to expect. We support all areas of law and would welcome the opportunity to work on your legal project no matter if it’s a contract or a patent, an international financial agreement or paperwork for that new house you are closing on in Europe. We have supported many law firms with their translation needs and continue to do so. 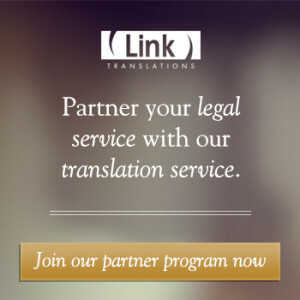 So why is having a professional translation service like Link-Translations important for attorneys and law firms? With international business comes the need for legal negotiations and documents that are passed between companies and individuals around the world. Having those documents accurately translated can be vital to your business’ success. In addition, we have court certified translators who are able to provide vital services for attorneys and their clients including translators certified for the federal court system who speak many languages from Afrikaans to Haitian Creole to Zulu. Find more information about our legal translation and interpretation services through our website at www.link-translations.com/legal-translations.